Friendly stallholders displaying unique and tempting gifts, lights twinkling on the frost, heady aromas of spice, stirring Christmas carols and a mug of hot chocolate or mulled wine to warm your hands… Escape the trauma of the frenetic high street crush this year and saunter on down to the West Country for some pre-Christmas ‘me’ time and the magical experience of a festive market. This is the perfect time to recharge your energy levels before the whirl of the holiday season, whilst the price of a cottage break is blissfully easy on the wallet. Bring a shopping basket, explore top-notch goodies, enjoy an evening or two relaxing by an open fire or in a cosy village inn and head home with a smile and a car full of presents to make a heap of happiness under your tree. “What if Christmas, he thought, doesn’t come from a store. What if Christmas… perhaps… means a little bit more!” Christmas is coming all across the West Country and we’ve put together a few of our favourite events which will fill even the bah humbug-est Scrooges with festive sparkle. Not quite a market, but the perfect stop-off on your pre-Christmas Devon break to enjoy a Festive Feast lunch or dinner or brush up on your culinary skills by booking courses in Christmas Bread and Baking or Christmas Curing and Smoking. What’s more we’ve a little gift for you: 10% off if you quote ‘RCHelpfulTen’ when booking. This annual event on the Cathedral Green has a Continental flavour, but with a wide range of Devon businesses and performers centre stage. Choirs, bands and carol singers will raise the roof on the bandstand, so join the crowds to browse the stalls and feast on sumptuous local food and drink. If you love making cards and decorations, head to Rosemoor for inspiration and all you need for beautiful creations to impress. For epicures, there’s a Christmas Food Fair on 3rd December and a Christmas Antiques Fair, where you’ll be sure to pick up unusual and unique gifts, on 16th and 17th December. What’s more, from 17th November, the lovely gardens are colourfully lit from Thursday to Saturday, creating a stunning winter wonderland. 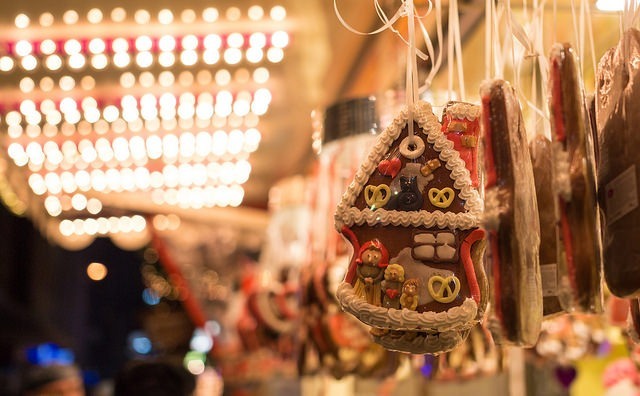 The city centre Piazza hosts over 60 twinkling log cabin style stalls selling hand-crafted gifts from the South West and further afield, warming drinks in a Bavarian bar with heated seats and festive food to sample and plan for your Christmas dinner. Oops, we’re cheating a little with this one since it’s all about horses not Christmas exactly, but a pony mad child who’s thrilled by a sparkly dandy brush in their stocking on Christmas morning will love this horsey heaven. Over 200 stands with all things equestrian will get your shopping list ticked off and the horse-themed events, including a parade to music and show jumping, will have you on the edge of your seat. If the clip-clop leaves you cold, head to Westpoint the week before (24th to 26th November) for the spectacular Christmas Shopping Fayre. The wide variety of independent shops on the genteel high street of this eclectic and unique old town come alive each Tuesday evening to offer all sorts of crafts, food and festive drink, whilst buskers, dancers and carol singers create a seasonal atmosphere. This Christmas Market is one of Cornwall’s best known, hosting around 10,000 visitors to the beautiful, historic harbour town. As well as lovely treats in the boutique shops along picturesque streets, hand picked traders offer locally produced fine food and drink and festive gifts and you may bump into Dawn French who lives in the town. Ninety local businesses which have all been awarded the prestigious ‘Made In Cornwall’ status display their wares, from jewellery to clothing and gourmet hampers. We defy the hardest heart not to be seduced by the beautiful local crafts and delicacies in the county which is a honey pot of inspiration for all kinds of talented artists. Pretty Padstow comes alive with lights reflecting across the harbour and the pubs and restaurants a hive of jolly chatter. Last year more than 50,000 visitors attended this popular event and this year it’s even bigger and better with pop-up stalls selling Cornish artisan breads, cheeses, cakes, preserves, beers and gins and all sorts of arts and crafts and top chefs giving demonstrations which may inspire your Christmas dinner. Even Santa won’t miss this festive event. He’ll be visiting on Saturday and Sunday, ostensibly to meet the children, but we suspect he may also be tempted by the delicious local produce, crafts and gifts, cookery demonstrations by leading West Country chefs and abundant carolling. Grade I listed Mount Edgcumbe is magnificent at any time, but in its Christmas finery it’s truly stunning. Sixty festive stalls are laden with beautiful gifts, delicious treats and unique hand-crafted items and you can treat yourself to hot chocolate and mince pies at the cafe and enjoy carols in the courtyard and entertainment for the children. Later in December, Father Christmas makes his arrival, you can create your own wreath at a workshop and take to the skating rink with its disco light and ‘starry’ sky. Beautiful Bath… Take a break in Somerset and the historic city must be on your itinerary, especially over these winter weeks when 200 chalets take root on the Georgian streets to sell local and handmade gifts. Musical entertainment will ease your tired feet and you may even have a thrilling glimpse of the Snow Queen wafting through the stalls on 23rd November. Christmas spirit prevails in the town as the Christmas lights are switched on and you can source quality crafts, gifts and produce at The Cheese and Grain, then recover over live entertainment and festive food and drink. On 20th December the Christmas Farmers’ Market provides your scrumptious supplies for a delicious and indulgent Christmas feast and on 21st December you can hear Irish singer Cara Dillon perform carols, Celtic hymns and other Christmas songs. The medieval village steps back into the past for a couple of days when a lantern lighting procession wends its way from The Steep whilst stilt walkers illuminate the streets with candles on Friday. On Saturday, 17th century soldiers carry flaming torches, so bring your medieval costume to feel part of the amazing atmosphere, but have some modern pennies handy to shop in the picturesque little stores whilst morris dancers jig, carols are sung and traffic is banned. The platform of this charming heritage railway station will be a-buzz with stalls selling local crafts and treats, from Exmoor driftwood art to marshmallows, Somerset lavender, sheepskin rugs and colourful glass. If you fancy a steam ride, stay on until 11th or 12th December when you can catch the Carol Train, or board the Santa Express or Sherry and Mince Pie Train throughout the month. The Workhouse Chapel is transformed into a wonderful Christmas shopping venue selling hand-crafted work from over 60 of the West Country’s finest makers and artists. Enjoy a drink beside the open fire and browse the tempting treats, from handmade baskets to jewellery and leather and metal work, and you’ll probably come away with a few presents for yourself too. Taking place at the beautiful Athelhampton House and Gardens, this is a feast for the senses as Dorset’s finest produce is displayed for your delectation. Forget soggy sprouts, this fair will transform your Christmas menu, as you sample sweet and savoury flavours created by over 50 suppliers, from fragrant homemade pastries to unusual meats. The £2.50 entry also includes access to the Tudor house and gardens, making it a weekend to remember. You may even spot Santa flitting amongst the topiary. Not exactly a Christmas fair, but this National Trust Italianesque mansion where generations have celebrated is full of festive atmosphere, recreated from lists and letters written by Henrietta Bankes as she prepared for Christmas over 100 years ago. Wander the gardens which are a fairyland of twinkling and colourful lights, visit Santa in the old laundry and the shop in the 18th century kitchen block is full of beautiful gifts for friends and family, from gardening tools to bird boxes made on the estate and Cerne Abbas Ale (and treat yourself to some holiday reading from the Potting Shed second hand book shop). This will get your shopping wrapped up for sure, with stalls from over 65 local makers and sellers featuring vintage items, handmade Christmas cards, home furnishings and lots more. It’s a chance to buy direct from the creative talent of Dorset and marvel at beautiful creations. We’ve cosy cottages of all shapes and sizes available in the run-up to Christmas – if you need a little help making a choice, just call us (01647 433593) and we’ll be pleased to make suggestions. And if you don’t have Christmas sorted yet, check out our collection of fantastic holiday cottages and reserve your home-from-home for a fun festive break with the family. Happy Holidays!